Citizen Protest Puts West Meadow Parking Lot "On Hold"
On November 2nd, at about 8:00am, Vicki Krueger received an early-morning visit from her neighbor. “I was about to go to the Farmers’ Market when a neighbor knocked on my door. She informed me that her husband had just been at the Meadow and had noticed that a tree had been cut down on the edge of the park across from the Post Office.”Ms. Krueger’s condo, located across from Central Park, is a three minute walk from the Central Park’s “West Meadow,” the grassy green space south of the Post Office. 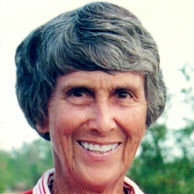 In an interview with the Voice, Ms. Krueger confirmed that when she and her neighbor walked down to inspect the West Meadow that morning, they “saw the stump where a tree had been cut down“ and also saw that part of the West Meadow “had been marked-off with orange tape” next to the Post Office parking lot. 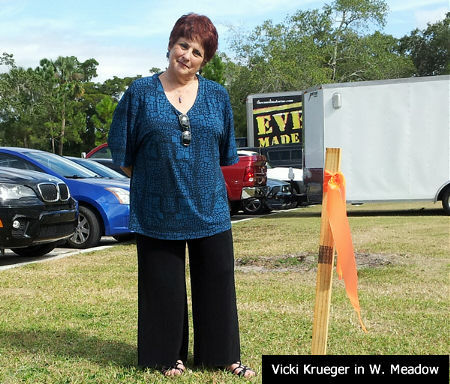 Ms. Krueger told the Voice that several days prior to her discovery of the marked-off area, she had learned of the city’s interest in paving part of the meadow, but mistakenly believed that no action would be taken before further Commission discussion. Krueger Challenges City Surveyors and Public Works Official. 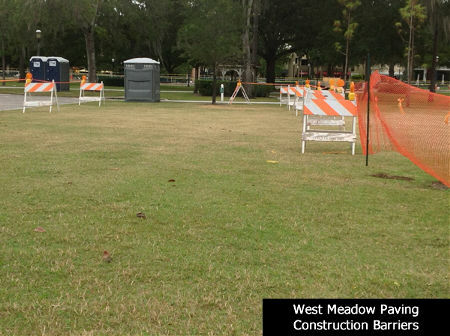 City Had Planned to Pave 12 New Parking spaces on West Meadow by Nov. 30. Don Marcotte, Asst. Director of Public Works, arrived at the Meadow shortly after Ms. Krueger spoke with the surveyors and, according to Krueger, “Confirmed that the paving was going forward.” Ms. Krueger says she handed Mr. Marcotte a copy of an independent parking garage study and “after some discussion, he told us that the work would be stopped, at least for the day.“ Click the button below to view the Public Works memo discussing the Parking Expansion timeline. Citizens Dispute City’s Parking Rationale – Conduct Their Own Parking Availability Surveys. Over the last two weeks, several citizens – including Ken Murrah, Vicki Krueger and others – have written the City asking for reconsideration of the city’s plans to expand parking in and around Morse Blvd. and Central Park. Mr. Murrah and Ms. Krueger have each conducted independent surveys of parking availability near Park Ave. Their counts of available parking spaces over multiple days/hours/locations are at odds with the City’s own parking surveys. The City surveys are a key factor in the City’s decision to expand parking. Click the button below to view the City’s Parking Study. Did Commissioners and City Staff Agree to Meadow Parking Expansion Without Actually Voting on It? We spoke with Ms. Howard at length about the City’s decision-making process – the process that led to the City’s initial decision to pave a section of the West Meadow by Nov. 30. We asked about the hearings, meetings, public notifications and votes that led to, and ultimately authorized, City staff to add 100+ parking spaces in and around downtown. On Friday, Ms. Howard told the Voice that her research – done in the limited time she had to respond to our questions – indicated that parking expansion was discussed at several meetings including the June 24, 2013 Commission meeting (during which a consultant presented the City-commissioned Parking Study), and the Sept. 6 Strategic Planning Session. According to Ms. Howard, the Commission did vote to formally “accept” the Parking Study during the June 24 meeting – and asked City staff to come back with specific recommendations to expand parking. Click the button below to view the staff Parking Study analysis. Ms. Howard indicated that in the Sept. 6 Strategic Planning Session attended by Commissioners and City staff, Public Works Director Attaway presented his suggestions for creating 100+ additional downtown parking spaces including making/paving new spaces in the West Meadow. However, it appears that since this meeting was a work session – not a formal Commission/Board meeting – no actual vote was taken regarding the West Meadow paving, nor was any formal notice given to the community that City staff would implement the paving/parking expansion administratively (without a formal vote by the Commission). Parking Expansion and Paving the Meadow Will Be Discussed in Today’s 3:30pm Commission Meeting. Multiple sources have told the Voice that even though City Commissioners will discuss the City’s Parking Expansion plan, they may or may not decide to vote on paving the West Meadow. Sources confirm that inaction by the Commission could result in City staff moving forward as planned to pave the meadow and implement the rest of the Parking Expansion. Am I the only resident in Winter Park who still believes we should be a City of Homes? A city that cares for its residents first before big business and developers? This was the vision of those who founded Winter Park and the reason my family settled here in 1961. We decided to make Winter Park our home because of the ambiance of this city – the eclectic architecture, the lakes, the green spaces, the tree canopy and the warmth of the people we met who shared our values. Winter Park is changing – and faster than most people realize. It is becoming an urban, commercial city, not a City of Homes. There is this constant urgency from our elected officials and those they have appointed to our Boards, to diversify our tax base. Our taxes are lower than some cities near us. They say the portion paid by our residential taxes is too great but as a City of Homes, that is what should pay our taxes. If City Hall focuses on its homeowners, instead of commercial interests, homeowners like myself will be willing to pay the taxes that maintain our quality of life. We say we are a City of Culture and Heritage but our heritage is disappearing and without a sense of history, we will be nothing. Our city is changing. We now face a threat that our park land will be decreased and our city services reduced. Change comes; change can be good but only if it enhances what we already have. Our home values will decline if we lose what we have always loved and treasured about Winter Park. My hope is that there are enough people in Winter Park who are aware of what is happening and who will care enough to act before it is too late. Thirteen years ago, Nancy and I had our first dinner on Park Avenue. Interestingly, our server also worked as an appraiser. When I asked her why we should buy a home in Winter Park vs. somewhere else, she was quick and clear. This is a great community with good schools. Demand is steady for homes in Winter Park, even in down markets. Most important, we have a wonderful quality of life. Turns out she gave us good advice. We quickly discovered that the quality of life we enjoy here is the result of the years of effort that went into developing and refining our Comprehensive Plan. Winter Park has a blueprint for growth that was put together with community involvement over a long time and is key to our success as a community. We have the good fortune to be governed by a set of rules and regulations and that is both understandable and appropriate. Those rules, however, are being challenged by developers who are coming into our community with their eyes on the “big returns” and many of us feel we are not being adequately represented by those on the Planning and Zoning Board (appointed by the Mayor) or sitting on the City Commission. 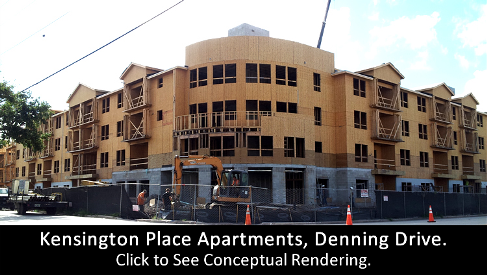 We are seeing a huge increase in density, for example, in the North Denning corridor. Large structures are being squeezed onto small pieces of property; and it’s not just one. We have seen the former Department of Motor Vehicles building lot stripped clear in preparation for another high-density structure. 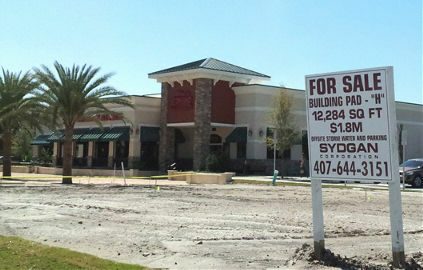 Folks that brought us the Great Winter Park Land Swap of 2011 have a contract on a property on 17-92. 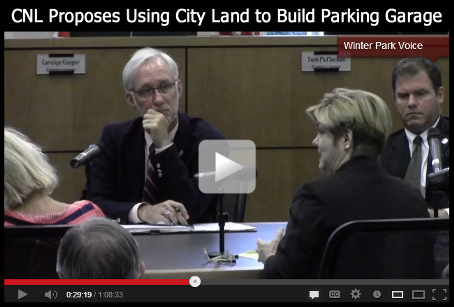 It is apparently too small to build what they want, and they have had the audacity to request the city give them access to Winter Park property by the Rachel D. Murrah Civic Center to build a parking garage. Really? It is astonishing that such a request would clear the hurdle to make its way to the commission to be considered. Does this bother you at all? Do you care what the citizens think about this? I think we should have responsible commercial development that conforms to the Plan and to the rules we have. Any exceptions should be subject to close public scrutiny. If you attempt to sell us the standard party line, “We need to do whatever’s necessary to attract development to maintain, lower or keep taxes down,” . . . I say to you: “Show me,” and I will stand there until you do. We should NOT be making periodic changes to a plan we spent months almost years to complete. In the words of Mayor Bradley “In my four years on the council, I’ve found if we try to rush things, bad things happen.” (September 12, 2013 Winter Park Forum). I have to agree with the Mayor and ask why the urgent need to make changes and if there is a need why do so without appropriate due process including broad community input and involvement. When a developer asks to increase density on a property, I believe board members and commissioners have a fiduciary responsibility to demonstrate publicly how that will benefit the city or impact our tax base. If the impact is not significant, why would we say yes and have to live forever with the consequences? As you know, our property tax bills are public information, so I will use ours as an example. Ours was $12,393.71 for 2013. Only $3,003.27 or 24% of that went to the city of Winter Park, and that included debt service of $224.01. State Law directed $3,724.40 or 30% to Public Schools, Local School Board assessed $2,313.03 or 19%, Orange County got $3,047.26 or 18%, St Johns Water Management District got $227.65 or 2% and there were Non-Ad Valorem Assessments of $45.79. So allowing multiple exceptions to our density rules will reduce my $2,965.99 in Winter Park taxes by how much? Please tell me I am waiting. And why are you not asking us what we think? Don’t assume you know what we want. Listen to us. Ask us, and above all have the intestinal fortitude to say no when no is the right answer. When you ran for office, every one of you promised to represent the interests of Winter Park’s citizens. We believed you, and we elected you. Many of us are now beginning to believe that our trust in you was badly misplaced. 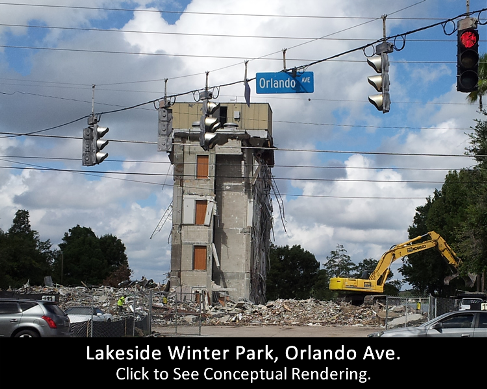 Please show us that isn’t so and do so before the quality of life we enjoy in Winter Park is negatively impacted. In the first half of the joint EDAB/P&Z workshop held on August 15, WRT consultant, Silvia Vargas, explained her study of Winter Park’s Comprehensive Plan and Land Development Code — and the numerous changes the study proposes.The City-commissioned study summarizes the purpose of the Comp Plan and Land Development Code (LDC) this way: “If the comprehensive plan is, essentially, the ‘what we want to do’ of the community, the LDC is the ‘how we are going to do it.’” Details of the study are published in the 8/15/13 Voice story that follows this update. Images below show some of the close-in commercial properties permitted and developed under the current Comp Plan and LDC.Orange County Development Codes : A Model for Winter Park Development? The WRT study is seen by some city residents as laying the groundwork for elimination of City regulations that serve as a check on developer over-reach in the City. Others see the study’s recommendations as a road map to streamlining City codes that they believe are hindering economic development. 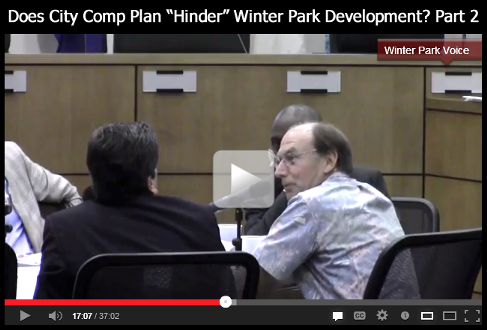 Peter Gottfried, a member of the City’s Planning and Zoning Board, illustrated the latter view by pointing out the development strategy pursued by developer Dan Bellows, who obtained less-restrictive building approvals in Orange County before having his Ravaudage development annexed into Winter Park: “The perfect example of that is a developer who decides to go develop a large piece of property and decides to go through the Orange County development approval process rather than go through the Winter Park process – and that’s Dan Bellows’ project at Lee Road.” Mr. Gottfried appeared to compare Winter Park’s approval process unfavorably with Orange County’s process, flatly stating: “. . . I think Orange County provides a fair and equitable [ process ] – even though you might not like their rules . . . I think as we move forward we need to decide how we’re going . 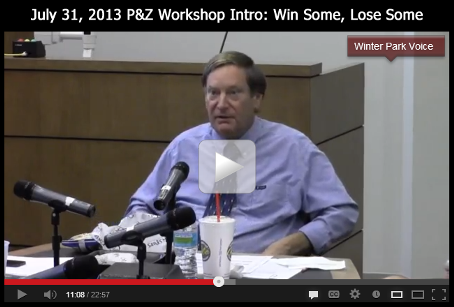 . . to tackle revising some of these things that need to be revised . . .” (Video, Part 2 – 16:15)Another view of the contrast between Orange County and Winter Park development regulations is illustrated in an analysis written by P&Z board member, Pete Weldon – also a proponent of regulatory overhaul in the City. In his analysis of Ravaudage development (obtained by the Voice in a public records search), Mr. Weldon concludes that Orange County development regulations enabled Mr. Bellows to potentially build out Ravaudage at significantly higher density, “. . . Having accepted the terms of the annexation that include operating under Orange County codes and entitlements . . . the city approved Ravaudage densities somewhere in the range of 50-100% more favorable for the developer than would have been available under city code.” Mr. Weldon’s analysis can be viewed by clicking the button below. Weldon Ravaudage Analysis An increase in allowed building density as noted above is among the most hotly debated issues whenever significant changes to Winter Park’s land development regulations are proposed.Other regulatory policies – like the City’s “Conditional Use” standards that allow certain kinds of development if prescribed conditions are met and approved – were questioned during the hearing. 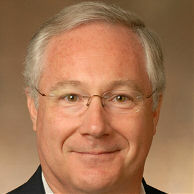 EDAB board member, Steve Flanagan, criticized the standard saying, “. . . as a ‘recovering’ developer, I have to tell you it scares the living daylights out of me every time I think of it – because as a developer, you come into a community hoping that you can understand the rules and that if you obey them, you can get your project done.” (Video, Part 2 – 11:20)Mr. Flanagan also questioned use of Floor Area Ratio (FAR) standards – particularly in the Fairbanks corridor – asserting that development is “stymied” by current FAR regulations that limit bigger buildings on limited-size parcels. Will High-Density Buildings Reduce “Sprawl” and Lower Residential Property Taxes? Consultant: Purpose of Regulations is to “Provide Predictability” for Developers and Keep Factories Out of Neighborhoods. Conditional Use is a mechanism that has been used by the City to regulate the approval of businesses seeking to locate here. One example of this use is regulation of what types of businesses can locate on the Park Avenue. P&Z Board Member Johnston: Are We Scrutinizing Rollins College Development Plans? Ms. Vargas admitted that she did not look closely at the Rollins/Winter Park relationship, but did say that she recommends keeping education “concurrency” in City codes – a policy that that ties future development to increases in the City’s educational resources. P&Z Members Gottfried & Sacha: We Need Independent Facilitator to Get This Done Right. Consultant Vargas: We Need Lots of Public Input. Director Stone promised one public board hearing that would be part of an overall review process that will be finally decided by the City Commission. Ms. Stone estimated that the process could take as long as three months to complete. Patrick Chapin quickly jumped in supporting Gottfried’s point: “I really disagree with ‘the hindrance of development’.“ Instead, Chapin suggested his interpretation of the study’s message as promoting the “economic well-being” of the community. As Dori Stone offered her final remarks and ended the meeting, it was unclear whether she intends to implement Silvia Vargas’ suggestion that the City should”. 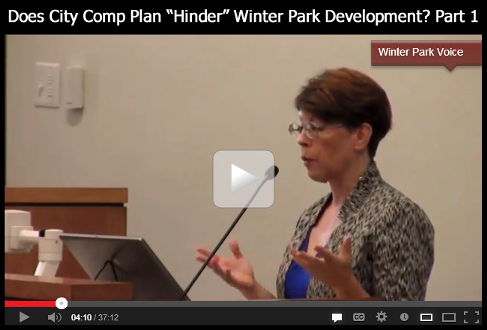 . . go to the community first – and we go to them repeatedly until we get it right . . .” Ms. Stone offered to include public and board comments sent to her via email at dstone@cityofwinterpark.org in her presentation to the Commission. We contacted Ms. Stone in the days after the workshop attempting to learn more about her interest in using Ms. Vargas as a continuing independent facilitator as suggested by some board members – and whether she will schedule – or ask city officials to authorize – multiple public meetings as suggested by Ms. Vargas. 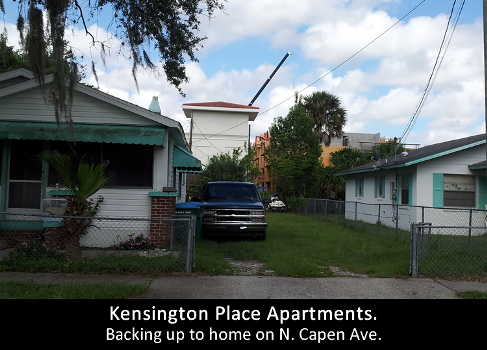 Winter Park Voice will update this story and provide continuing coverage of related hearings. Commission: Who’s Doing Who a Favor Here? Monday’s City Commission hearing did not go well for CNL. A fundamental disagreement between CNL and the City Commission was whether the City should expect some compensation in return for allowing CNL to build a large parking structure on the City’s Civic Center parking lot – a property valued at $1 to $2 million.The workshop started on a sour note – with CNL’s Paul Ellis standing firm on his position that CNL should pay nothing and that the City should be happy with the increased / accelerated tax and fee revenue it would receive when CNL develops the property. CNL’s ask for City help – and the implication that prime 17-92 real estate might not otherwise attract significant developer investment – bore a striking similarity to claims made by Dan Bellows in his long campaign to share millions of dollars in City tax and fee revenues. The appearance of some strategic nexus between the two developers was further strengthened by the scheduling of “dueling workshops” held on the same afternoon on July 22. In yesterday’s CNL workshop, Commissioner Cooper rubbed Paul Ellis the wrong way by referring to CNL’s controversial 2011 Progress Point land swap deal with the City. Cooper complained about CNL’s current approach to the City, saying that ” . . .it is indefensible to me, to face other developers in this community and say to them ‘Yes, CNL is at the trough for a second time’ . . . My phone has been ringing off the hook . . . if we are going to give away City land to subsidize commercial development, it needs to be equitable and fair . . .” Click the video image below to view the workshop. Commissioner Cooper was not the only Commissioner complaining to Ellis. At various points during the workshop, each Commissioner offered criticism of CNL’s offer. More about that later . . .
First, a bit of history on the project: In late July, as noted above, the usual end-of-month City Commission meeting was bookended by two separate workshops – held on behalf of CNL and Ravaudage developers – both of whom did their best to convince the City to hand over City treasure in return for enhanced development along the 17-92 corridor. First up was Dan Bellows and Ravaudage CDD representatives, asking for City tax revenues and fee sharing to help build out $60 to 70 million in Ravaudage infrastructure – some of which would also serve areas beyond Ravaudage. As with past requests for taxpayer assistance, Mr. Bellows ran into skepticism on the Commission. However, Mayor Bradley did indicate some interest in the proposal when he pointed out that some part of the millions required to create infrastructure in the area could conceivably be paid by the City anyway – if Ravaudage did not exist and that part of the city developed piecemeal over time. The Mayor offered his opinion that “…at some point, I think there is some responsibility for the City to do something.” Click the video image below to view the Ravaudage workshop. Ravaudage CDD Attorney: City $$ Not Used Unless Builder Performs, But . . . Builder May Be Unable to Perform Without City $$ Guarantee. 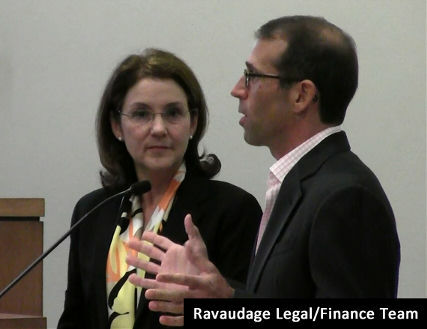 After Commissioner Cooper pointed out that a key reason that CDDs are set up is to allow developers to raise their own infrastructure funding in the bond market, Dan Bellows and the Ravaudage CDD attorney, Jan Carpenter, countered that their funding request is “performance” based and that City dollars would only be spent as development of the land actually proceeds. Carpenter asserted that development of Ravaudage “won’t happen – or it won’t happen quickly” if the City does not agree to provide the millions of dollars in assistance being requested. Even though Mr. Bellows left the workshop less than satisfied with the Commission’s response, both he and Mr. McMacken were well aware that CNL was, in fact, waiting in the wings for their own shot at the City Commission that same afternoon. Mr. Bellows attended the CNL workshop, observing the proceedings from start to finish. Click the video image below to view the July CNL workshop. Unlike Mr. Bellows, CNL’s Paul Ellis used his afternoon workshop time to ask for land – not money. Ellis’s bid follows on the heels of his successful pitch in 2011 that persuaded the Commission to swap a piece of CNL land on the Orange Avenue railroad tracks for the City-owned State Office Building at Morse and Denning. CNL’s Paul Ellis: Our Parking Garage on City Property = More, Bigger, Better, Quicker Development + Extra Taxes and Fees for City. This time around, CNL Commercial Real Estate has a contract to purchase the Mount Vernon Inn at Morse and Orlando Avenue and convert it into a mixed-use complex of multi-family apartments, restaurants and a 100+ room business hotel – if the City will allow CNL to build a large parking garage on the adjacent Civic Center parking lot. CNL is proposing a “Public-Private Partnership” to build the multi-story parking garage on the City-owned parking lot. Like Mr. Bellows, Mr. Ellis paints a picture showing the City largesse he requires being amply rewarded by bigger, better, denser and quicker development that will pour tax and fee revenue into City coffers – development he claims cannot proceed without City help. CNL Wants Quick Answers. Promises $4.1 Million City Gain if Garage is Approved. CNL’s proposal, which was explored again at Monday’s 2:00pm workshop, is illustrated in a PowerPoint presentation that can be viewed by clicking the button below. The City’s Agenda Package includes a financial analysis that projects a $4.1 million (NPV) gain for the City if it allows CNL to use City land to develop the garage and Mt. Vernon site as planned. Questions posed by Winter Parkers interviewed by the Voice, workshop participants and by the Agenda document itself are shown below. What is the increased value of the Mt. Vernon property if the garage is approved? Is the current 356,472 square ft. project, as contemplated, appropriate and desirable for 17-92? Does the City see benefit in using City land, already designated for parking, to enhance desirable development along 17-92? CNL says that its proposed garage will enable significant new development throughout the adjacent area. 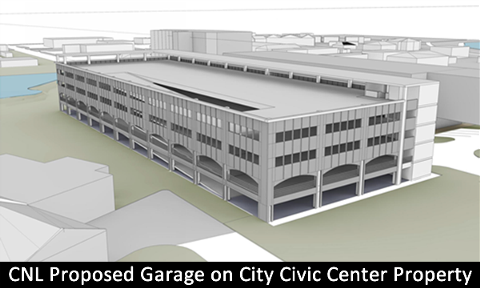 If CNL controls use of the garage, will it have the power to influence nearby development? Will the garage and increased project density enhance or degrade use of MLK Park and the Civic Center? How will it affect pedestrian and automobile traffic? On The Other Hand, Here Are Some Ideas We like . 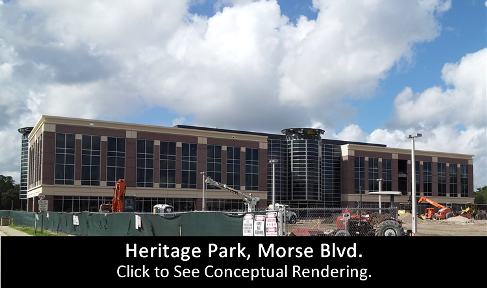 . .
CNL’s vision of a high-end business hotel near Morse and 17-92 – and the possibility of a deal that might fund the refurbishing the “very dated” Civic Center proved to be a tantalizing prospect for the Mayor and Commissioners. Comments by officials on the City side of the table painted a clear path to a successful negotiation – if CNL is willing to tread that path and bring with them a strong package of incentives to sweeten the deal. However, at the close of the workshop, Paul Ellis and his attorney offered no additional incentives and, in the Commission meeting that followed the workshop, CNL’s proposal was dropped from the agenda by unanimous consent. Winter Park Voice will update this story and provide continuing coverage of the city’s hearings, if any, on CNL’s proposal. On Tuesday, August 6, Winter Park’s Planning and Zoning board sent a significantly reworked restaurant zoning proposal on to the City Commission.The board voted unanimously to support the proposal that was put together by an informal Task Force comprised of Chamber of Commerce officials, local merchants and Frank Hamner, the attorney for the Holler family, whose real estate holdings include significant Park Avenue retail space. Mr. Hamner led the presentation in Thursday’s hearing, covering much of the same ground he covered in the prior week’s P&Z restaurant ordinance workshop. One notable modification that was made in the week that transpired between the workshop and the hearing was the inclusion of a “three month rule” that requires Park Avenue corridor landlords to re-lease vacated restaurant space within three months or risk being subjected to more stringent regulation and potential loss of the full package of regulatory benefits and designations enjoyed by the previous restaurant tenant – a key benefit being the possibility that a quickly re-leased space could include a non-fine dining restaurant that might otherwise not be permitted. Mr. Hamner illustrated his presentation with PowerPoint slides, each of which can be viewed below in our initial 8/6/13 coverage of the P&Z workshop. A significant change being proposed is the outright ban of fast food chain restaurants. 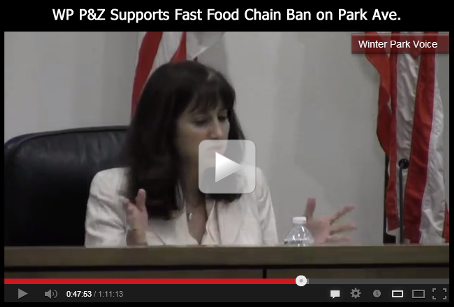 Discussions among P&Z members and Task Force participants revealed broad support for the ban, which has been strongly – and vocally – advocated by Winter Parker residents. Mr. Hamner echoed the sentiments of City Planning Director, Jeff Briggs, stating that past attempts to create ordinance changes that resolved conflicting views among city officials, city residents, merchants and others had been largely unsuccessful. The City’s own P&Z staff report laid out the multiple failed attempts by the City to resolve the issue. The staff report language can be viewed below in our 8/6/13 coverage of the P&Z workshop, or by clicking the button below. Hamner said that this formula would, as of now, permit an “additional seven or so non-fine dining restaurants” in the Park Avenue corridor. The proposed cap generated much discussion at the hearing and motivated board member Pete Weldon to send in a detailed response to the proposal via email. Mr. Weldon’s email can be viewed by clicking the button below. 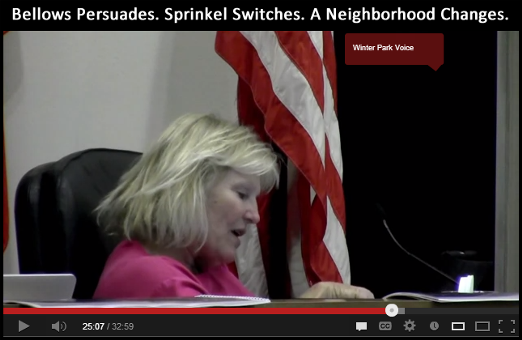 Winter Park Voice video of the P&Z hearing and vote can be viewed by clicking the video image below. 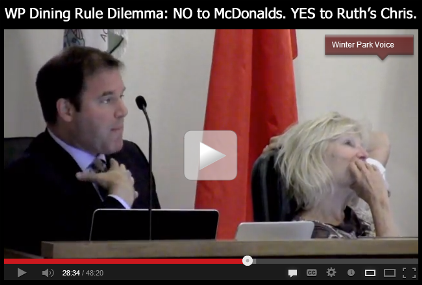 This video also features public comment during the hearing. However, as noted above, the discussion at the prior week’s P&Z workshop covers most of the same ground and – due to the less formal format of the meeting – the exchange between the board and the Task Force is more detailed – yielding probing and insightful comments and questions from the board, including new members Ross Johnston and Sheila De Ciccio. Click the button below to view 7/31/13 Workshop Video. Part one of the 7/31 workshop video (click image below) shows Planning Director Jeff Briggs’ introduction to the workshop wherein he updates board members with a concise summary of City business. 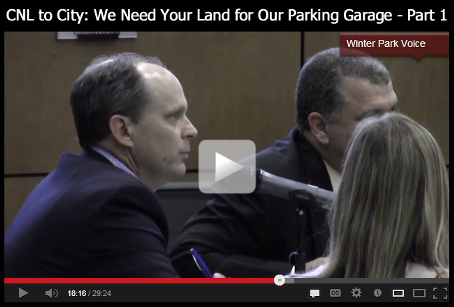 Mr. Briggs’ presentation reveals an occasional inside view of City business, including a frank assessment of the politics of Florida Hospital’s recent withdrawal of its request for approval of a new parking garage planned at Winter Park Hospital. Winter Park Voice will update this story and provide continuing coverage of the city’s hearings on restaurant ordinance revisions. On Monday at 4:00 PM the Mayor and Commissioners will hold a workshop on the request to form the Ravaudage Community Development District. A vote on this request must take place by April 8th, as there will be no opportunity for public input at Monday’s meeting. As the Mayor and Commission consider the Ravaudage Community Development District, they need to consider the impact, long term and potential challenges in its approval. Many developments in Winter Park and Central Florida have been successful without CDD’s, so a question: Would the development be successful or be able to obtain the financing to complete without this? A commitment to this developer now will set a precedent others may expect. No one can convince me that the development of 48 acres will not require additional city services and infrastructure. You as commissioners have already taken on that obligation though annexation. 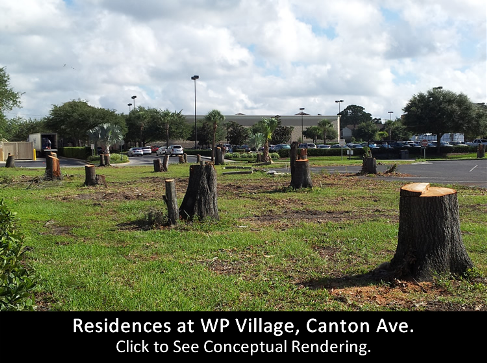 The developer, investors, present and future owners should not benefit or be underwritten by the rest of the property owners and taxpayers of Winter Park. Just reading Governor Scott’s Executive Order Number 12-10 (Review of Special Districts) http://www.floridacddreport.com/Scott.pdf is enough of a red flag for me. Many folk in the City of Winter Park wonder and some believe that the developers of projects in Winter Park get what they want from the City and Commissioners; there is a history of Winter Park approving projects which we were later on sorry we approved, and in some cases paid millions to undo. Development should be able to stand on its own and if planned and done well benefits all. The City of Winter Park has no business being a “partner” in development when the potential for benefit is to the developer and not the City. I can only hope that the Mayor and City Commissioners have the courage to do the right thing: Deny the application for the Ravaudage Community Development District. Developers and development, especially in the City of Winter Park should not be funded or underwritten by its citizens and taxpayers. 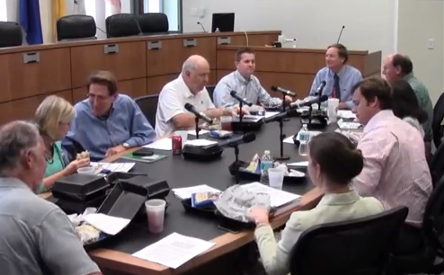 5/19/13 Story Update: Last Monday’s Commission discussion of fast food and fine dining standards generated plenty of dire predictions and hypotheticals, but no ultimate resolution. In an effort to keep fast food restaurants from overrunning Park Avenue, the Commission ran over the City’s proposed ordinance time and again trying to make sense of it. After a long, exhaustive discussion, the ordinance was tabled – on life support once again – awaiting an infusion of new ideas from city staff, attorneys, concerned citizens and merchants. Bradley & Commission Wrestle With How to Include High-End Franchises While Excluding Others. Both Commissioner Leary and Commissioner McMacken were less reluctant than Mayor Bradley in their willingness to rule on Conditional Use applications by restaurants. Commissioner Cooper argued for banning all non-fine dining restaurants from Park Avenue. Even though there were points of agreement among the Commissioners, patience in the chamber wore thin at times. Shortly before the Fine Dining ordinance discussion began, Mayor Bradley and Commissioner Cooper had a brief dust-up in a prior discussion concerning Ravaudage that triggered a momentary walkout by Ms. Cooper. Both Cooper and Bradley recovered quickly, however. Leary: “Quality Establishment Like a BurgerFi” Needs Opportunity to Request Entry to Park Avenue. City Policies Designed to Discourage the “Food Courting” of Park Avenue. By the end of the discussion, the Commission had not moved significantly closer to consensus. Any sense that they were edging in that direction was strongly challenged by Frank Hamner, attorney for the Holler family, whose retail tenants include both BurgerFi and Firehouse Subs. Holler Attorney: You Can Take This “Hypocritical” Ordinance and . . . Re-do It. Mayor Bradley immediately moved to table the ordinance; Commissioner Leary seconded the motion and the Commission voted unanimously in favor of the motion. Chapin: “Heartburn Happens” When Fine Dining Rules Not Enforced at Restaurants Like BurgerFi. After the vote, Mayor Bradley allowed other citizens to continue the Public Comment portion of the hearing. Patrick Chapin from the Chamber of Commerce and Lambrine Macejewski, President of the Park Avenue Merchants Association were among the commenters. Neither supported the proposed ordinance as written. Once the meeting adjourned, a small group gathered in the back of the chamber to discuss the ordinance. Included in the group were Frank Hamner, Patrick Chapin, Lambrine Macejewski, Jeff Briggs and Commissioner Leary. After a short discussion, the group left the public area and walked together back toward Jeff Briggs’ office in the Planning and Zoning Dept. Cooper: Let’s Stop All Restaurant Approvals Until We Vote on New Restaurant Rules. In the days following the hearing, Commission Carolyn Cooper asked City Manager Knight to convene a meeting of Commissioners to discuss enacting a moratorium on issuing permits for future restaurants on the Avenue. The point of the moratorium would be to give the city time to work out its new policy without risking another application by a fast food restaurant attempting to come onto the Avenue by promising Firehouse Subs-style “Fine Dining” table service. Documents obtained by the Voice lead to the conclusion that no one other than Commissioner McMacken was willing to meet with Commission Cooper to discuss the issue. Cooper and McMacken will meet in the Chapman Room (Room 200) next to the Commission chambers this Wednesday, May 22, immediately following the Commission’s 3:00pm Ravaudage work session. Click the button below to view documents pertaining to Commissioner Cooper’s meeting request. It took ten months, but the city has resurrected last year’s debate about what kind of businesses – specifically restaurants – are welcome on Park Avenue. On Monday, May 13, the City Commission will consider modifying the ordinance that defines which types of restaurants are acceptable. Last July, City Hall was abuzz with concern about the half-empty block on Park Avenue between Comstock and Fairbanks. The Holler family owned most, if not all, of the vacant space on that block. That same month, the Holler’s attorney, Frank Hamner, testified in support of an effort by city staff to provide relief in the form of special zoning concessions for these properties. The concessions would have enabled a broader range of businesses to occupy first floor retail space. BurgerFi & City Face Off Over Table Service Agreement. Within days of last year’s Commission hearings on Park Avenue zoning changes, BurgerFi opened on the Avenue just north of Fairbanks. 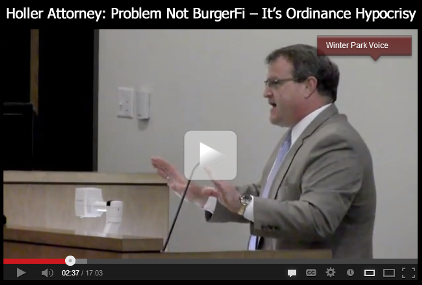 Earlier that year, BurgerFi persuaded the city to approve its building application by promising to provide table service as required by the city’s “Fine Dining” ordinance language. However, less than one year later, relations between the restaurant and the city have soured. City’s staffers confirm that the city believes that BurgerFi is not keeping its “Fine Dining” promise. More about that later. During last summer’s Commission hearings, some Commissioners worried that long-vacant store fronts on the block spelled danger for the Avenue. There appeared to be support on the Commission for zoning modifications and creative interpretations of existing regulations. However, many Park Avenue merchants were skeptical, suggesting that property owners on the block could revitalize the area without special concessions and fast food restaurants. Ultimately, community and merchant opposition forced the tabling of the special concessions. Today, the block is flush with new businesses bracketed by a new Viking appliances showroom on one end and by BurgerFi on the other. Firehouse Subs Gains Foothold on Avenue with Promise of Full “Fine Dining” Table Service. Despite the block’s newfound prosperity, new zoning language has once again come before the Commission – at the same time that a new fast food restaurant, Firehouse Subs, is making plans to occupy another Holler-owned store front. And, once again, the Park Avenue Merchants Association appears to be highly antagonistic to any move that will encourage franchise-style, fast food eateries on Park Avenue. 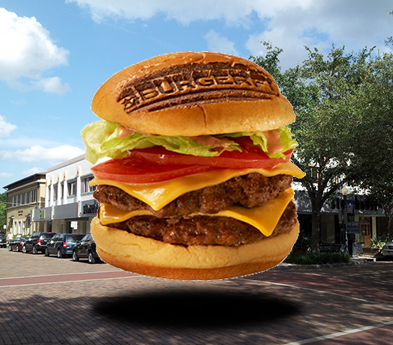 The city’s acceptance of Firehouse Subs’ February 26 building permit application seems to validate merchant concerns that allowing BurgerFi to gain a foothold on the Avenue would open the door to more fast food in downtown Winter Park. However, new “Fine Dining” language being proposed by the city actually appears to be an attempt to discourage future applications from these restaurants. 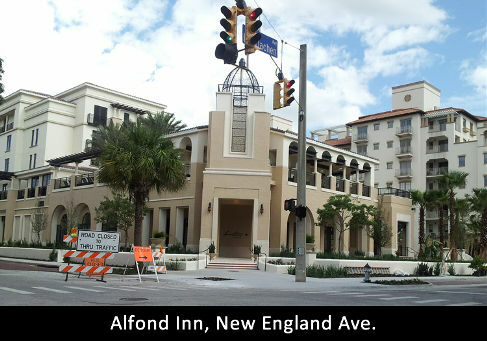 In an interview with the Voice last week, Planning and Zoning Director, Jeff Briggs revealed that the city looked to an historic shopping district in south Florida as inspiration for the city’s new “Fine Dining” guidelines: “The new ordinance language being proposed for the city’s definition of permitted fine dining and fast casual restaurants is modeled on the standards established for the historic Worth Avenue district in Palm Beach, Florida. “The City’s C-2 zoning code, in effect along Park Avenue and New England Avenue, makes “fine dining” restaurants a permitted use. Other restaurants (not meeting that definition) are conditional uses which require the provision of parking in order to create a new restaurant location. In effect, “fine dining” restaurants are given a ‘free pass’ or parking variance if they meet that definition. The intent was to allow, as has occurred, for new restaurants such as Luma, Prato, Paris Bistro, Cucina 214 and Nelore Steakhouse to start up on Park Avenue without having to provide parking. Unfortunately the only differentiator for “fine dining” versus other restaurants is table service versus counter service. Burger King or McDonald’s could come to Park Avenue if they offered table service. Coffee shops and other non-destination establishments that do not generate high parking demand are exempted from the proposed restrictions. For more details on the proposed modifications, click the button below to see the Commission Agenda document that lays out the changes. Will the Proposed Changes Calm Merchant Fears that a New Fast Food Era is Beginning on the Avenue? The Merchants Association won’t officially speak on the matter until their meeting this Monday, the day of the Commission meeting. However, last week the Voice interviewed Merchants Association President Lambrine Macejewski and VP Steven McElveen. Ms. Macejewski and Mr. McElveen, speaking for themselves, expressed opposition to fast food franchises on the Avenue – whether or not these businesses conform to the “Fine Dining” model that includes servers taking orders at tables and delivering food and drink as traditional restaurants do. Ms. Macejewski, who owns a Tex-Mex restaurant on East Welbourne Avenue, commented that the city’s approval of Firehouse Subs to open on the Avenue “has upset a lot of merchants . . . they’re concerned about the integrity of the Avenue.” Ms. Macejewski promised that merchants will attend the Commission meeting to learn more about – and possibly comment on – the city’s intentions. 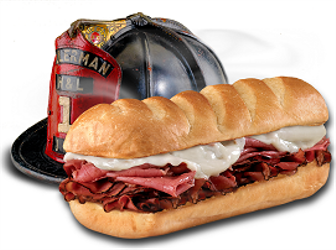 Click the Button below to read the Firehouse Subs letter. Our Investigative Reporting, In-Depth Research and Video Coverage are Giving Our Readers a Clearer, Deeper View of City Policies & Issues.We’ve Made a Commitment to Keep You Informed. Please Consider Supporting our Journalism. The language in the Firehouse letter appears to satisfy city staff that Firehouse will provide fine dining table service as currently defined in the city ordinance. However, because the letter specifies that customers may order at the counter if they wish, Firehouse’s promise does not conform to the new fine dining standards being proposed by Planning and Zoning. The new city rules would prohibit restaurants from offering counter service to customers who choose to dine on the premises. Nevertheless, it appears that Firehouse has been approved to open on the Avenue. City staff tells the Voice that the Firehouse table service agreement passes muster because they applied for their building permit under current rules several months ago. If Current Zoning Rules Prohibit “Sub Shops” from Opening on the Avenue, How Did Firehouse Subs Get Approved? Briggs was less charitable toward BurgerFi, which appears to be ignoring assurances they gave the city. According to Briggs, BurgerFi has responded to city concerns about their table service policy by offering to submit a written guarantee to the city that full table service is available to customers who request it – and to prominently post signage informing customers of the policy. Mr. Briggs sees that offer as an attempt to get the city to bless BurgerFi’s current policy, which, so far, has resulted in very few diners taking advantage of full table service. BurgerFi May Face Code Enforcement Crackdown if Table Service is Not Upgraded. Briggs is clearly unhappy with BurgerFi’s response, and the long lines of customers waiting to place orders at the counter day-after-day: “That was their offer to get us to deem them in compliance. To me that is insufficient.” It appears that nothing less than a dedicated wait staff and a stronger commitment to making table service a reality will satisfy the city. Barring that, city staffers in Code Enforcement may soon be visiting the restaurant to issue citations that could result in daily fines. The Voice asked Code Enforcement officials how this process would play out if fines are assessed and are not paid by the restaurant. We were told that standard procedure at the city is to ultimately foreclose on property where fines have remained unpaid. This past week, the Voice dined at BurgerFi during lunch hour. I stood in line like everybody else and, before ordering, asked the cashier whether table service was available. I was informed that table service was available, but “not during BurgerFi’s busy times.” During lunch I did not see any table service other than meals being delivered to tables after diners had ordered at the counter. Also, just like any at fast food franchise, diners were getting themselves soft drinks out of self-serve machines, pumping their own condiments, dumping food wrappers into waste receptacles and depositing dirty trays into a rack. I did not observe any signage that offered a full table service option. The next morning I visited the restaurant again at 11:00AM and sat down at a table on the patio waiting for a server to take my order. No other customers were in the restaurant, which appeared to be fully staffed in anticipation of the upcoming lunch rush. BurgerFi’s general manager, Don Clemence, kneeled down at a table nearby making some sort of repair. After five minutes I was approached by an employee who offered to take my order. Instead, I asked to interview the manager. Mr. Clemence, who’s been with the franchise for two months, confirmed that BurgerFi does have a policy of offering table service to anyone who asks, but was unaware of any discussion of providing signage to let customers know that a table service policy exists. Mr. Clemence acknowledged that only a small percentage of customers take advantage of BurgerFi’s full table service option. Unfortunately, while the ordinance requires ‘non-fine dining restaurants’ to obtain conditional use approval, it stops short of restricting ‘non-fine dining restaurants’ from Park Avenue. I believe this ordinance, as proposed, does not provide the Park Avenue brand the protection it deserves. Mica on P.O./Central Park Deal: Last Time, “All Hell Broke Loose.” This Time, Citizens Must Be United. 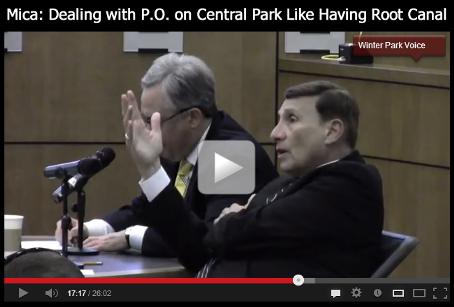 On Monday, April 15, during a commission-sponsored work session, Congressman John Mica shared his views on how the city might finally convince the US Postal Service (USPS) to move the Winter Park Post Office farther north on New York Avenue – thereby freeing up land that could be used to expand Central Park. The USPS has, so far, shown no interest in moving the WP post office or reducing its footprint. P.O. Says “No Right of First Refusal.” Insists on Getting True Market Value for Its Property. Bradley/Knight: City Wants “Perpetual Right of First Refusal.” Keep P.O. Out of Developers’ Hands. After Randy Knight’s summary, Congressman Mica pulled his microphone closer. Then, like the seasoned politician he is, Mica drew a laugh from the audience by comparing the city’s USPS dealings with a root canal. Rep. Mica then got down to business – presenting his view of how federal, local and political realities have shaped – and will continue to shape – negotiations on the post office property. Congressman Mica Remembers When “All Hell Broke Loose” During Carlisle Debate. Mica: Postal Service is Broke. May Be Ready to Deal Now. Our Investigative Reporting, In-Depth Research and Video Coverage are Giving Our Readers a Clearer, Deeper View of City Policies & Issues. We’ve Made a Commitment to Keep You Informed. The congressman ended on a note of cooperation, telling the commissioners ,“You set the priorities and I will follow up as best I can” – leading to the conclusion that Winter Park’s best approach to dealing with the post office property might be to rely on Congressman Mica to persuade Post Office authorities to move their distribution operation out of the city center – then build a new walk-in “retail” post office north of its current location within the same large parcel of land it now shares with city park land. Bradley on P.O. Site: “Time to Start New Chapter.” Let’s “Brainstorm” New Library, Other Options. Congressman Mica also briefly touched on SunRail and other projects. His comments can be viewed by clicking WPV video image above. 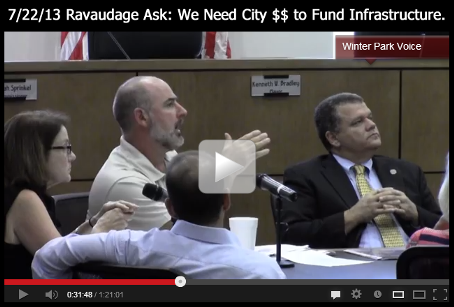 Winter Park Voice requested comment from all City Commissioners, Randy Knight and Rep. Mica. No comments were received as of press time. Revenue-Sharing Dead For Now. Can Developer Succeed Without It? This afternoon, after a long discussion of the property rights of landowners and businesses that reside within the Ravaudage development, the City Commission voted unanimously to approve the Ravaudage CDD. WP Chamber of Commerce CEO, Patrick Chapin spoke on behalf of the CDD. 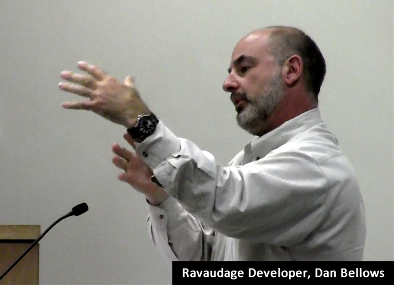 Chances are good that on Monday, April 8, Winter Park’s City Commission will vote “yes” for the second and final time to approve Dan Bellows’ Ravaudage CDD. Monday’s likely “yes” vote will give the go-ahead to the creation of a Commercial Development District that will enable Bellows and his partners to elect themselves as the first Board of Supervisors in a brand new governmental entity. Commissioners who question granting such broad powers to Mr. Bellows have learned that they have little choice in the matter. In response to questions from the Commission during a recent hearing, City Attorney Larry Brown advised that the city must approve a CDD application unless it has reasonable, legally compelling reasons not to. Learn more about CDD “General Powers” here, “Special Powers” here and overview here. On March 25, in the first of two votes required on the matter, the Commission voted to amend and approve the CDD, but raised numerous concerns during the meeting. Despite their unanimous “yes” vote on the CDD, the commission insisted on a modification to the CDD that removed any linkage between the CDD and the “Interlocal Agreement” that would have granted the CDD millions of dollars in city subsidies. Another sticking point for Mayor Bradley, Commissioner Cooper and others was the CDDs power of eminent domain. The Mayor appeared to favor stripping the CDD of all eminent domain powers, but attorney Brown advised the panel that doing so would conflict with state law. By blessing the CDD, the city will enable the new entity to start raising money using tax-exempt bonds. The bad news for Bellows and company is that the Interlocal Agreement (ILA) has been pulled off the city commission agenda. It appears that the ILA has been tabled for now. 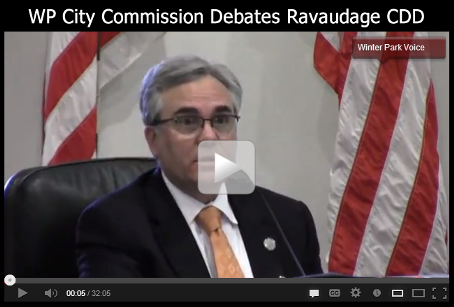 During the March 25 Commission hearing on Ravaudage, City Attorney Brown characterized the linkage as “innovative . . . something I’ve never seen before.” Minutes later, Dori Stone, the city’s Development Director, informed the commission that it was actually the city’s own “Special Counsel”, Ken Artin, who formally requested the linkage. The commission was unable to directly question the counsel regarding his rationale for such an action because, as Mayor Bradley pointedly noted, the special counsel did not attend the hearing. Nevertheless, as reported by the Voice on March 25, the Commission’s response to the ILA revenue-sharing plan was overwhelmingly negative. If City Withholds Interlocal Economic Incentive Payments, Will Ravaudage Falter? “Randy, the below is part of an e mail I received from the CDD general council. I am not sure how all this is just coming up? 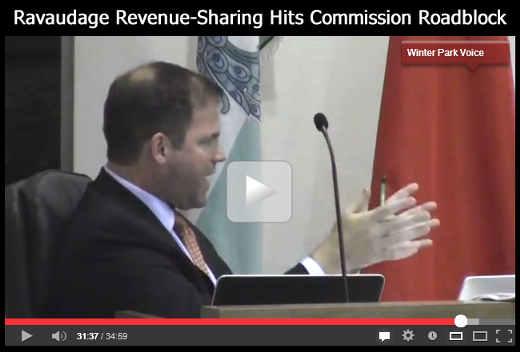 If CDD Passes & Interlocal Fails, Is Another City Revenue-Sharing Deal Lurking in Our Future? If lack of bond market support and/or denial of city subsidies effectively stalls Ravaudage development – or if the threat of a development bust appears credible – will the City Commission respond with a new package of economic incentives? Sources with city government experience tell the Voice that if ILA subsidies are denied at this point in time, they may ultimately morph into another city plan to underwrite Ravaudage development in the near future. One way or another, there appear to be several scenarios under which the city could find itself entangled in Ravaudage affairs and potential development shortfalls. Brown stated more than once that the city would never be liable for CDD/developer/property owner indebtedness unless the city is somehow motivated to voluntarily assume CDD debt. “I don’t want them to issue a large sum of bonds and hold those monies in construction trust accounts, and then the CDD only goes so far into the actual construction leaving large sums of money in bond trust accounts – and then the landowners default, assessments stop coming in, the CDD now forecloses. What usually happens is they get a foreclosure judgment, that’s assigned to a special purpose entity controlled by the bond holders – and then those people come in and ‘value-engineer’ the heck out the construction improvements, so you really don’t get what you contemplated getting with Mr. Bellows’ demonstrated history of development . . . You’re dealing now with banks and their consultants – because that’s been my experience – and they try to look at the construction improvement report developed by the district engineer and ‘value engineer’ it, because there’s financial incentive for them to preserve as much as possible, bond proceeds, in those trust accounts and not spend them on construction improvements. The prospect of sharing city revenues with Ravaudage developers has forged an unusual coalition of city officials who often have difficulty reaching consensus on development-related matters. Two of the more unlikely allies on this issue are Peter Weldon, Winter Park’s newest P&Z board member and City Commissioner Carolyn Cooper. Even though Weldon and Cooper both support the proposed CDD in one form or another, they – along with most of the city commission – stand with the many city residents who wrote in to city hall opposing the city’s revenue-sharing plan. Leary: Is Revenue-Sharing All That Different from Past Developer Incentives Given by City? Even though the winds of ILA disapproval were blowing strong during the March 25 hearing, Commissioner Leary boldly tread where few were willing to go. Addressing his fellow commissioners, Leary started out with a disclaimer: “I’m not crazy about this, the way it exists . . .” then began to tick off a list of concessions and variances the city has offered other area developments including the Alfond Inn and Unicorp’s proposed Lakeside center on Lake Killarney. Leary reminded the commission that “we do things for people all the time” and noted the “nine million dollars . . . for the Fairbanks sewer project” committed by the city. Mr. Leary’s comments and comments from other commissioners can be viewed in the WPV Video below. Monday’s Commission meeting starts at 3:30 P.M.
WPV requested comment from the Mayor, Commissioners and Dan Bellows. No comments were received as of press time. Dan Bellows can’t have been happy with the reception his “Interlocal” revenue-sharing proposal got at City Hall tonight. Though it seems likely he’d gotten wind of commissioners’ objections prior to the hearing, he may not have been prepared for the intensity of the commission’s negative response. No vote was held on the Interlocal agreement tonight, but Bellows now knows he’s got a lot of work to do to move commissioners in his direction. On the other hand, Commissioners were far more supportive of Bellows’ petition to create a CDD. The CDD will enable him to raise his own development funds using tax-free municipal bonds. Unlike the Interlocal agreement, the CDD will not entitle Ravaudage to any share of city/CDD property taxes. The Voice’s next installment of Ravaudage coverage will include more reporting and video of tonight’s City Commission meeting. Though this week did not start well for Dan Bellows and his development team, last Monday marked the beginning of a sort of official “debut” for Bellows’ Ravaudage — with Bellows shuttling his party of legal and financial experts from one city event to the next. First up last week was Monday’s Ravaudage workshop, followed the next day by another appearance of the experts at the Economic Development Advisory Board (EDAB). Click here to read Ravaudage column by Owen Beitsch, Asst. Chair, EDAB. Last Tuesday’s EDAB meeting featured questions from the EDAB panel and testimony from Bellows’ team that ultimately garnered an EDAB “thumbs up” for Bellows’ CDD and multi-million dollar revenue-sharing proposal. However, on Friday, Bellows’ development vehicle blew a tire when news leaked out that Ravaudage had lost its bid to build a new baseball stadium for Rollins and a local minor league team. 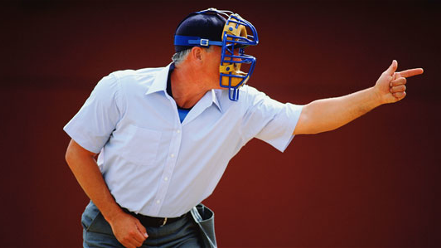 The proposed baseball stadium was seen by some at the city as an important factor distinguishing Ravaudage from other nearby developments that are expected to emerge soon. Dori Stone, Winter Park’s Economic Development Director, went so far as to name the stadium as an important reason the city is considering subsidizing Ravaudage development. 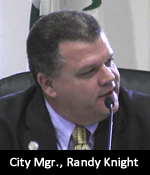 In an interview last Friday, City Manager, Randy Knight revealed to the Voice that the 75-25% revenue split with Ravaudage (proposed for the first five years of the deal) is now off the table. Instead, the city will consider an even 50-50 split of revenues for the 35 year life span of the Interlocal agreement. Sources inside city hall believe that this concession is being offered as a way to help eliminate city losses projected during the first five years of the revenue-sharing period – and to smooth the way for approval of the project. Will Dan Bellows Be First “Mayor” of Ravaudage? At Monday’s City Commission workshop, Bellows’ financial analyst, Brett Sealy, bluntly described the political power the city will be granting the developments if it approves the CDD: “CDDs are governed very much the way [the city is] governed. A CDD board is, initially, appointed by the land owner. It’s got five supervisors.” Sealy confirmed that Ravaudage will eventually be run by “qualified electors within the district” who are elected starting six years (or more) after the initial board of supervisors is set up. Sealy said that many governmental functions will remain with the city of Winter Park including police, fire, zoning and other regulatory powers. However, as City Manager Knight told the Voice, some regulatory powers including the right to grant “conditional use” variances to Ravaudage businesses and residents will/may reside with the Ravaudage board—a right established prior to Ravaudage annexation into the city of Winter Park. Also, according to Ravaudage attorney, Jan Carpenter, the district board will have the right to foreclose on properties within the CDD that default on CDD assessments. What, Exactly, is City Getting for Its Money? Can Developer Change Plans at Will? A common refrain among some city staffers and politicians on the question of sharing city property taxes with Ravaudage is: Would you rather have 50% of something or 100% of nothing? Others have noted that developers have successfully invested — and continue to invest — their own money on significant developments within a mile of Ravaudage. 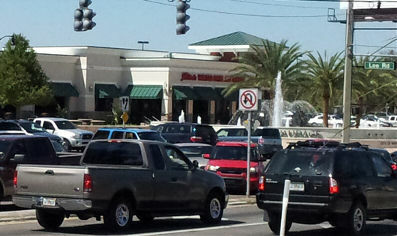 Winter Park Village is one notable example. As reported earlier, City Manager, Randy Knight told the Voice that he believes development at Ravaudage would proceed at Ravaudage without funding from the city — albeit more slowly. On Friday, Knight told the Voice he believes that — despite the loss of the proposed baseball stadium — the city’s investment in Ravaudage development can still be justified as a way to fast-forward infrastructure in the area. Knight also pointed out that infrastructure assistance is not needed by other nearby developments, because of the better-developed infrastructure in those areas. Winter Park Voice readers who closely follow development in the Lee Road/17-92 area have pointed out that traffic impact studies at the county level are not yet complete — leading to the conclusion that lack of definitive transportation studies in the area may, at some future date, impact development in and around the Ravaudage traffic corridor. 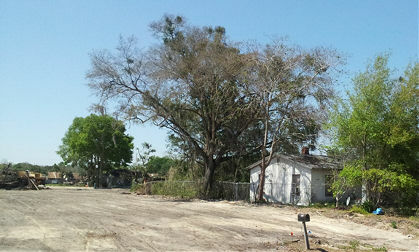 Is “Blight” a Development Strategy? City Development Director, Dori Stone, Mr. Bellows and others at the city have defined the Ravaudage development as a “blighted” section of the city with poor infrastructure. Advocates of the development proposal have leaned heavily on this designation to justify the extraordinary support being asked of the city. There is no question that much of the Ravaudage area, which was governed by Orange County before annexation into Winter Park, has suffered from under-developed infrastructure for many years. It’s also true that Mr. Bellows has owned many of these properties for years. During a recent commission hearing on Bellows’ blighted properties on Winter Park’s Westside, local builder John Skolfield characterized Bellows’ development strategy as “Rezoning by neglect.” Skolfield’s colorful presentation – and Bellows’ even more colorful four-word rebuttal can be viewed (at 21:00) by clicking the WPV YouTube image below. Will Our Children Be Telling “Bellows Stories” 50 Years From Now? Dan Bellows appears to be well on his way to establishing himself as a gifted and troublesome local legend. Over the many years that Bellows has worked with Winter Park’s politicians and regulators, he’s established a reputation as a hard driving, but persuasive negotiator in his interactions with city staff, board members and commissioners. Sometimes, however, Bellows’ intensity backfires, as illustrated in a recent Observer story featuring Maitland Councilwoman Bev Reponen accusing Bellows of attempting to “bully” the Maitland city council and staff in recent Ravaudage-related negotiations. Even though Bellows’ property acquisition tactics and political maneuvers sometimes rub city residents and politicians the wrong way — he has often succeeded in convincing Winter Park’s P&Z members and city commissioners that what’s good for Dan can also be good for the city. The most recent case in point is Bellow’s successful bid to get the city of Winter Park to rezone his properties on Lyman Ave, a few blocks from city hall. 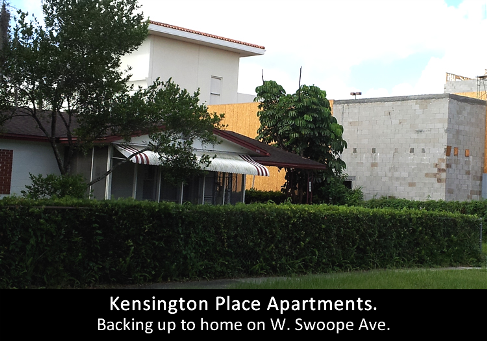 Even though the developer did not get all he asked for, he did manage to get the city to change several westside single-family residential lots to R-2 multi-family zoning. Bellow’s first stop in his attempt effect this change was an appearance before the city’s Planning and Zoning board. He managed to win over one or more reluctant board members by insisting that his plan to get the westside property rezoned was the only way he could seal a deal to sell the properties to another developer. One reluctant member, architect Randall Slocum, had trouble understanding why Bellows needed to rush the approval, instead of waiting for an upcoming review of city-owned property adjoining Bellows’ properties. Board chair, Sara Whiting, voiced the same concern. Board interest in waiting for the review appeared to be an attempt to better understand whether Bellows’ plan to introduce multi-family housing into the historic single-family-zoned westside neighborhood would be a good fit with plans to develop adjoining properties. However, any reluctance on the board was overcome shortly after Bellows sat in the almost-deserted commission chamber loudly repeating over and over that any delay would “blow the whole deal.” Board member Tom Sacha took Bellows’ plea to heart and repeated it on the dais as he advocated for a quick decision by fellow board members that would approve the rezoning and send it on to the city commission for final approval. Soon after, the P&Z board endorsed the rezoning of the Lyman Avenue property in 6 to 1 vote, with Sara Whiting casting the only “no” vote. When the rezoning proposal moved to the city commission for approval, Bellows once again encountered — and once again overcame — reluctance to approve his request. One of the reluctant commissioners was Sarah Sprinkel who, at the start of the hearing, declared “We’re talking about changing the rules to all these families . . . they are all single-family homes . . . we’re impacting those people and I just don’t want to do that. I just think that’s wrong . . . What if this happened in my neighborhood? . . . I would be fighting it tooth and nail.” But after many comments by other commissioners, pro and con — and impassioned pleas from Bellows and a Bellows opponent — Bellows once again worked his magic: Sprinkel reversed herself and joined Commissioner Leary and Mayor Bradley in approving Bellows’ multi-family re-zoning request on a 3-2 vote. WPV requested comment from the Mayor, Commissioners and P&Z board members. None were received as of press time. Earlier today, the Voice officially confirmed whispers within the community that the plan to build a new baseball stadium at Dan Bellows’ Ravaudage has fallen apart. Who Put the Kibosh on Ravaudage? The Digest admits that the plan was “not written in stone” and now it appears that the focus is shifting elsewhere in Winter Park, or beyond. City Manager Knight remains hopeful, adding that “We’re looking at other locations” within the city. The Voice will publish more Ravaudage news and analysis soon. Stay tuned. Longtime Winter Park developer, Dan Bellows, has been assembling a 54 acre patchwork of properties on the corner of Lee Road and 17-92 for well over a decade. And now, after talking to City Hall for years about his Ravaudage development, he’s within weeks of securing a Community Development District (CDD) “partnership” with the city. This partnership will provide significant infrastructure funding for Ravaudage. The CDD and an accompanying “Interlocal” agreement would set up the CDD – which will be controlled by Bellows’ development company, Benjamin Partners, Ltd. – to receive/raise close to $70 million in tax revenues, fees and bond money generated by the district over a span of 30+ years. These funds will be earmarked for infrastructure development within the district, but will not exceed the actual cost of development and/or bond debt, according to Randy Knight, Winter Park’s City Manager. Infrastructure includes parks, recreational facilities, water, sewer and power lines, traffic lights and other similar structures. This coming Monday, March 18, at 4:00 PM, the City Commission has scheduled a workshop that kicks off the final stretch of hearings required to give Bellows and his development company the permissions and revenues he’s requesting from the city. These City Commission hearings are tentatively scheduled for March 25 and April 8. This board will be comprised (initially) of the current property owners, Bellows’ Benjamin Partners. Eventually, however, other businesses and residents of the Ravaudage district will take positions on the governing board. Knight pointed out that regulatory powers including the right to issue building permits will be retained by the city of Winter Park. And, according to Knight, Ravaudage is still responsible for paying development-related impact fees to the city, which will not be shared with the CDD, should it be approved by the commission. –891,000 sq. ft. of office space. What Happens If City Doesn’t Approve Funding? City Commissioners could decide to approve the CDD, but not the Interlocal agreement. Without an approved Interlocal agreement and the millions of dollars it obligates the city to share with Ravaudage developers, Bellows and Benjamin Partners would have to raise funds by selling tax-exempt CDD bonds and by other conventional means on the open market. City Manager Knight commented that this approach would undoubtedly slow – but not stop – the pace of development at Ravaudage. CDDs are a tool used by developers throughout Florida to obtain upfront financing for their projects. In recent years, use of this tool has become controversial – primarily because a significant portion of these CDDs have gone into default leaving someone other than the developer liable for CDD debt. Industry newsletters, press reports and other sources indicate that market declines in recent years have affected the CDD default rate – which is pegged variously at 15 to 25%. Richard Lehmann, a widely quoted analyst with the Income Securities Advisor investment firm, noted in 2011 that “there are presently 168 CDD districts in Florida which are in default on over $5.1 billion in bonds.” Lehmann, who also writes a newsletter for Forbes magazine, estimates that Florida is home to approximately 600 CDDs. The questionable health of some Florida CDDs is a sticking point for some city residents who have expressed concern that the city may be “on the hook” for Ravaudage CCD payments if the developer defaults at some point in the future. How Are Funds Generated for CDD Developers? The City Manager explained that the city’s deal (should it be approved by the commission) will involve two funding elements: the first being a CDD that will give Bellows and the Ravaudage principals the right to raise funds using tax-free bonds. 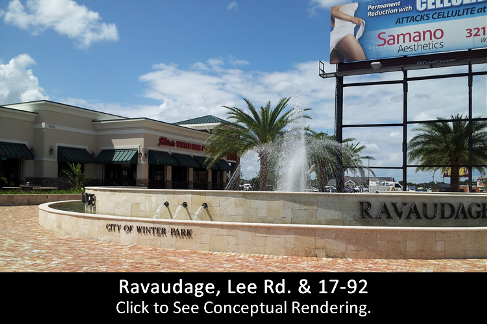 The second element is an Interlocal agreement wherein the city will agree to hand over to Ravaudage developers a significant portion of taxes and other revenue the city receives from businesses and individuals residing INSIDE the Ravaudage development district for the next 35 years – not unlike the CDDs formed to fund Baldwin Park, Celebration and the Millenia Mall. According to Mr. Knight, businesses located inside the special district will also be responsible for paying a Public User Fee or “PUF” to the developer that amounts to 1% of their revenues. These businesses usually pass on the 1% “PUF” assessment to their customers. PUF funds will be used for common area maintenance within the development. The City Manager noted that developers have the right to require this fee whether or not a CDD is created. In response to community concerns noted during our interview with Knight, he stressed again that the city will only contribute to the CDD a share of taxes and fees collected from new businesses and new residents INSIDE the boundaries of the CDD – not from city revenues collected elsewhere in the city. Knight confirmed that development inside the boundaries of Ravaudage, as currently envisioned, will include a mix of commercial/retail business, office buildings and Baldwin Park-style housing. Bellows, Rollins College and the city are also discussing the possibility of partnering on a baseball stadium that could house a professional minor-league team part of the year and also accommodate the Rollins team. The Voice requested documentation of stadium discussions, but was told that documents pertaining to that negotiation are not yet available for public review. Other sources tell the Voice that these documents are being shielded at the request of Rollins College. How Will Ravaudage – With or Without CDD Approval – Impact City Life? A review of city documents that are available, including meeting minutes and other files, reveals the depth of detail and many pieces of the puzzle that Mr. Bellows and the city have been assembling since at least 2009. Some of those files can be viewed by clicking the buttons shown below. The following language is excerpted from the proposed Interlocal agreement sent to the Voice by the city on Friday, March 15. The entire agreement can be viewed by clicking the “Interlocal Agmt” button above. The value of EIP for each Fiscal Year shall be computed in the manner set forth in this Section 5.02.
b. The amount of ad valorem taxes which would have been produced by the rate upon which the tax is levied each year by the City, exclusive of any debt service millage, upon the total of the assessed value of the taxable real property in the District as shown upon the most recent assessment roll used in connection with the taxation of such property by the City prior to the effective date of this Agreement. c. Nothing herein shall require the City to establish a particular rate of millage except as provided or required by general law or previously existing bond covenants unrelated to District bonds. 2) An amount equal to 1/2 of the City’s 6% public service tax for electric service attributable to properties contained within the geographic boundaries of the District and subject to the jurisdiction of the District, to the extent such taxes are paid to or received by the City. 3) An amount equal to 1/2 of the City’s electric service franchise fee equivalent attributable to properties contained within the geographic boundaries and subject to the jurisdiction of the District. 4) An amount equal to 1/2 of the City’s 10% public service tax for water service attributable to properties contained within the geographic boundaries and subject to the jurisdiction of the District, to the extent such taxes are paid to or received by the City. 5) An amount equal to 1/2 of the City’s 10% public service tax for metered natural gas, liquefied petroleum gas both metered or bottled, and manufactured gas tax attributable to properties contained within the geographic boundaries of the District, to the extent such taxes are paid to or received by the City and it is reasonably determined that such taxes are generated by properties within the District. 6) An amount equal to 1/2 of the City’s public service tax for fuel oil, and any motor and other vehicle fuel taxes, attributable to properties contained within the geographic boundaries of the District. 7) An amount equal to 1/2 of the City’s local communications services tax attributable to properties located contained within the geographic boundaries of the District. 8) An amount equal to 1/2 of the City’s garbage waste franchise fee, if any such fee is collected by the City, from properties contained within the geographic boundaries and subject to the jurisdiction of the District. (B) In each calendar year, the District will submit a Progress Report to the City outlining the volume of Completed Project Components in the previous Benefit Determination Year, as provided in Section 5.04. (C) The City will compute the EIP based on the Progress Report according to the EIP Calculation as provided in Section 5.02. (D) The City shall provide at the time of payment each year a report outlining all EIP revenues identified in Sections 5.01 and 5.02 of this Agreement as generated by properties located within the District. The City shall show within the report the revenues received per category and based upon the Progress Report submitted by the District, the EIP payments made as a percentage of revenues generated within the District. The Finance Director for the City shall certify the accuracy of the report to the District and remit said report to District with a sworn statement as to the accuracy of the report. The Voice has asked Dan Bellows and all City Commissioners and the Mayor to comment on this story. None have commented as of press time. This article has been updated to include more recent CDD default information.